Available in Black, Silver and Pearl, the clean lines and sleek styling of the YES Box N2100 makes it a welcome addition to virtually any home or office environment. Under the hood, the YES Box N2100 houses the Intel® 80219 Processor, featuring a high-performance, low-power core based on Intel XScale® Technology. Loaded with integrated features, this single chip solution provides more than enough muscle to process your digital data. For media buffs, the YES Box N2100 offers 2 internal 3.5" bays that accommodate two SATA hard disks for over 1TB of storage! The YES Box N2100 also offers users several disk storage options, including RAID 0 to optimize hard disks to deliver more throughput, RAID 1 and its disk mirroring functionality to keep data extra secure, and JBOD to simply give users more capacity to store their videos, movies, and photos. Accessible 24 hours a day, 7 days a week, the YES Box N2100 is built to be always on, allowing users unlimited access to their digital media. And with advanced power saving management, the YES Box N2100 consumes 30% less power compared to a similarly configured PC. The YES Box N2100 comes fully equipped with dual Gigabit Ethernet ports to enable lightning-fast file transfers, your digital media can be made available throughout your entire home or office network quickly and easily. Three high-speed USB 2.0 ports enable the YES Box N2100 to connect to your favorite high-speed flash storage devices, while one-button copy functionality allows the YES Box N2100 to copy and store your data at a touch of a button. With Intel XScale® Technology, large storage capacity, advanced networking capabilities, and multiple storage options, the YES Box N2100 keeps your data safe, secure, and accessible. Designed for hassle-free installation, the YES Box N2100 can be setup and running in a matter of minutes. With its intuitive web-based interface, users can manage their personal storage server from anywhere on the network with their favorite browser. Along with network neighborhood connectivity, the YES Box N2100 is compatible with today's most widely-used operating systems, including Windows, Apple OS X, and Linux, making file sharing between networked PCs more convenient than ever. The YES Box N2100 offers robust protocol support for enhanced connectivity. Use the YES Box N2100 as an FTP server to allow your friends or customers to access your digital assets via their preferred FTP software suite. Looking for the ultimate digital jukebox? 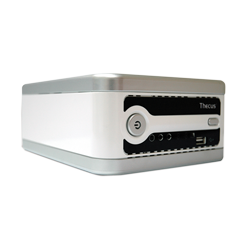 The YES Box N2100 can also be configured to be an iTunes® server, making your music accessible by networked PCs with iTunes installed. 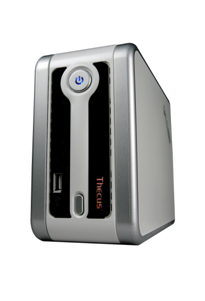 What's more, the YES Box N2100 comes equipped with the YES Community Photo Web Server. This handy application turns your YES Box into a fully-fledged photo bank, enabling users to create their very own digital photo albums that can be shared with every PC on the network! With the YES Box N2100, sharing your digital data has never been easier or more convenient. “The Intel® 80219 processor provides both the performance and bandwidth necessary for applications such as sharing digital media throughout a home or office network as demonstrated by the YES Box N2100,” said Mike Wall, General Manager, Intel, Storage Components Division. 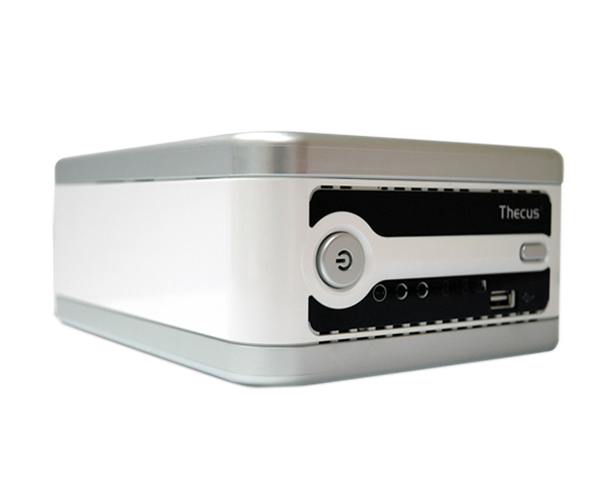 * Based on Firmware version 2.01.09, Thecus DLM Module 1.0.07.